In the Hebrew Bible, the Book of Jonah is the fifth in a series of books known as the Minor Prophets of the Hebrew Bible. Unlike other prophetic books, the Book of Jonah is not primarily a record of a prophet’s words. In fact, Jonah makes only one brief prophecy in the entire book. Instead, the book tells the story of the reluctant prophet who resists God's call, but finally brings a message of doom to the great enemy city of Nineveh, and ends up pouting in the desert because God shows mercy when the city repents. The story is based on an obscure historical figure who probably lived during the reign of Jeroboam II (786-746 B.C.E.). In the Old Testament, Jonah, son of Amittai is only elsewhere mentioned in 2 Kings 14:25. Because of its universalistic message of God's compassion for Israel's enemies, the general view of modern scholarship is that the Book of Jonah was written in the post-exilic period (after 530 B.C.E.). It is one of the best known biblical stories because of the dramatic tale of Jonah's being swallowed by a "whale" when he sought to avoid his prophetic call. Its message of God's compassion for the people of Nineveh anticipates the teachings of Jesus to "love ones enemies" and shows that even a prophet sometimes fails to see his own prophecy from God's perspective. "Jonah Cast Forth by the Whale." Jonah observes the fate of Nineveh. The story ends on an ironic, even humorous note, as Jonah retires to the desert to observe what would happen to the city. God causes a miraculous plant to grow up in a day in order to shade Jonah from the blistering heat, but then sends a worm the next morning to devour the plant. Jonah again complains, saying: "It would be better for me to die than to live." Jonah confronts the king of Nineveh. The story of Jonah can be seen as drama between a passive man and an active God. Jonah's name literally means "dove," while most prophets had heroic names (e.g., Isaiah means "God has saved"). God, the book's other main character, is altogether active. While Jonah flees, God pursues. While Jonah falls, God lifts up. The character of God in the story is progressively revealed through the use of irony. In the first part of the book, God is depicted as relentless and wrathful; in the second part of the book, He is revealed to be truly loving and merciful. The other characters of the story include the sailors in chapter 1 and the people of Nineveh in chapter 3. These characters are also contrasted to Jonah's passivity. While Jonah sleeps in the hull, the sailors pray and try to save the ship from the storm (2:4-6). Later, after Jonah has delivered his message in Nineveh, the king acts decisively, while Jonah retires to the desert to watch. While Jonah passively finds himself forced to act under the Divine Will, the people of Nineveh actively petition God to change His mind. 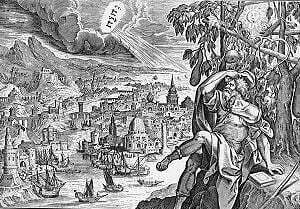 Jonah even objects to God's showing mercy to the Ninevites, seeming to prefer that God would fulfill his promise to destroy the city. While Jonah broods and watches, God again acts, causing a plant to grow up to shade Jonah one day, and causing it to wither the next. Finding his life unbearable, Jonah wants simply to lay down an die, but God teaches him that active mercy is better than passive death. The ultimate lesson of the book is thus that life and love—even love of one's enemies—triumph over abdication and death. The Book of Jonah's attitude of mercy toward Israel's enemies was a controversial one, contrasting sharply with earlier books of the Hebrew Bible as well as later ones such as the Book of Esther and the apocryphal Book of Judith, which emphasize themes of triumph and vindication at the expense of the Gentiles. Among the Dead Sea Scrolls, the book was only found in half of the ten Minor Prophets manuscripts. Others of the scrolls show that the Qumran sect held to a strict attitude of animosity toward the Gentile world of its era, foreseeing an impending battle in which the Gentile rulers of Israel and their Jewish collaborators would be completely vanquished. Thus, it is not surprising that the Book of Jonah would not be completely accepted among Qumran's residents, often thought to be Essenes. Beside the information given in the Book of Jonah itself, there is only one other biographical reference to Jonah in the Bible. According to 2 Kings 14:25, Jonah had prophesied that "the boundaries of Israel (would stretch) from the entrance of Hamath to the Sea of the plain" (that is the Dead Sea). The passage rather grudgingly admits that this prophecy was fulfilled by Jeroboam II, one of Israel's "evil" kings. This would date Jonah's ministry either to that of Jeroboam or earlier. Some commentators see him as the last of the northern prophets who started with Elijah. The next prophet, Amos, marks the first of the literary prophets active in the north, and he, possibly like Jonah, lived during Jeroboam's time. 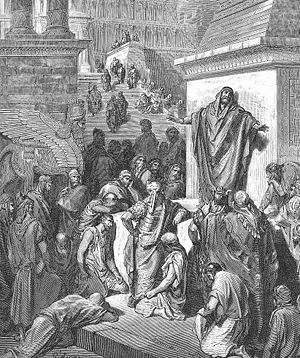 Rabbinical tradition usually considers Jonah to have been of the tribe of Asher, although some claim he was of Zebulum. One tradition holds that Jonah's mother was the "woman of Zarephath" that offered hospitality to Elijah and that Jonah was her son, whom Elijah revived (Pirke R. El. 33). Another legend says that it was Jonah whom the prophet Elisha dispatched to anoint the usurper Jehu as Israel's future king. 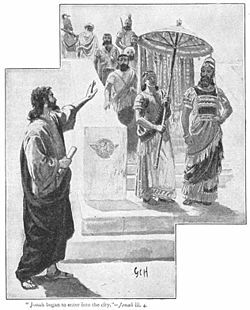 The reason Jonah tried to avoid prophesying in Nineveh is that he had gained a reputation for his words always coming true, and he feared he would be considered a false prophet when Nineveh repented. 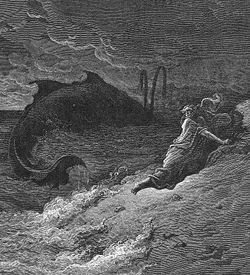 The monstrous fish that swallowed Jonah was none other than the legendary Leviathan (Pirke R. El. 10). He gave a portent concerning Jerusalem and the whole land, that whenever they should see a stone crying out piteously, the end was at hand. And whenever they should see all the gentiles in Jerusalem, the entire city would be razed to the ground. The earliest Christian interpretations of Jonah are found in Matthew (12:38-42 and 16:1-4) and Luke 11:29-32). In these passages, Jonah becomes a “type” for Jesus. Jesus compares his generation to the people of Nineveh, saying that no sign will be given except "the sign of Jonah." Jonah spent three days in the belly of the fish; Jesus will spend three days in the tomb. What are we to believe concerning Jonah, who is said to have been three days in a whale’s belly? The thing is utterly improbable and incredible, that a man swallowed with his clothes on should have existed in the inside of a fish. If, however, the story is figurative, be pleased to explain it. Again, what is meant by the story that a gourd sprang up above the head of Jonah after he was vomited by the fish? What was the cause of this gourd’s growth?” (Letter CII, Section 30). As, therefore, Jonah passed from the ship to the belly of the whale, so Christ passed from the cross to the sepulcher, or into the abyss of death. And as Jonah suffered this for the sake of those who were endangered by the storm, so Christ suffered for the sake of those who are tossed on the waves of this world. In his 1534 translation, William Tyndale translated the phrase in Jonah 2:1 as "greate fyshe," but he translated the word ketos (Greek) or cetus (Latin) in Matthew 12:40 as "whale." Tyndale's translation was later incorporated into the King James Version of 1611. Since then, the "great fish" in Jonah 2 has been most often interpreted as a whale. The throats of many large whales can indeed accommodate passage of an adult human. There are some nineteenth–century accounts of whalers being swallowed by sperm whales and living to tell about it, but these stories remain unverified. Many biblical scholars believe Jonah's prayer (2:2-9), occupying almost one quarter of the entire book, to be a later addition (see source criticism). At this point in the story, the reader would expect Jonah to repent. However, the prayer is not a psalm of lament; rather, it is a psalm of thanksgiving. The prayer serves to portray the fish as part of God's salvation. The the storm and the fish, God has removed Jonah from his self-destructive path of flight from his prophetic mission and has set him on the path to carry out God's will. The story of Jonah is set against the historical background of ancient Israel in the eighth century B.C.E. and the religious and social issues of the late sixth to fourth centuries B.C.E. The Jonah mentioned in 2 Kings 14:25 lived during or shortly before the reign of Jeroboam II (786-746 B.C.E.) and was from the city of Gath-hepher. This city, modern el-Meshed, is located only several miles from Nazareth in what would have been known as the Kingdom of Israel. Nineveh was the capital of the ancient Assyrian empire, which conquered Israel in 722 B.C.E. The book itself calls Nineveh a “great city,” probably referring both to its affluence and its size. However, modern scholarship questions that the book could have been written in the eighth century B.C.E., when the idea of a prophet bringing God' mercy to the chief city of Israel's greatest enemy was out of the question. On the other hand, the attitude of the book coincides with the latter chapters of the Book of Isaiah (sometimes classified as Third Isaiah and thought to originate with the fifth century B.C.E. ), in which Israel is given a prominent place in the expansion of God's kingdom to the Gentiles. These facts have led many scholars to believe that the book was actually written in this later period. Machinist, Peter. Prophets and Prophecy in the Ancient Near East. Society of Biblical Literature, 2003. ISBN 158983027X. New International Version and others – www.biblegateway.com. Book of Jonah – www.jewishencyclopedia.com. History of "Jonah, Book of"
This page was last modified on 5 June 2018, at 22:54.